The Prima balalaika is the most common size known and is the one used as the principal solo instrument. 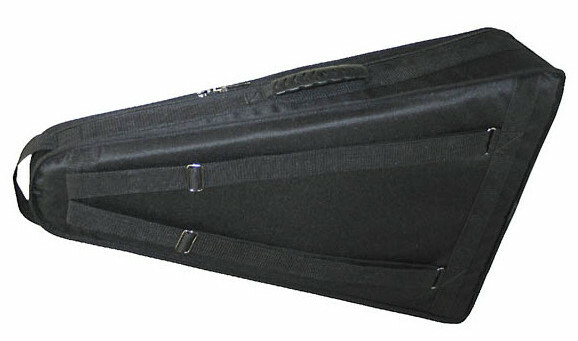 Many other sizes exist (piccolo, sekunda, alto, bass, contrabass, subcontrabass) and are generally used to accompany the prima. The prima balalaika is tuned E-E-A and normally has 3 strings. Four and 6-string balalaikas are known to exist but the 3-stringed type is by far the most common as they are easier to play the rapid runs required of the balalaika. Most 6-string instruments are considered to be of inferior quality. My Russian-made (read “Soviet”) balalaika was originally built in Moscow in 1981 by the Moscow Experimental Musical Instrument Factory – Moskovskaya Eksperimental’naya Fabrika Muzikalnykh Instrumentov. This balalaika was a gift from a close friend who studied in Moscow in the early 1980’s and naturally has great sentimental value to me. As a budding amateur luthier I decided that I wanted to try to make some improvements to the instrument. So I decided to start by stripping it down and refinishing it completely. This process would entail performing a number of upgrades to the instrument not only to improve the acoustics, but especially to improve the appearance. The instrument was in desperate need of a new fretboard, the original was of such poor quality, with a stained, uneven surface, and soft brass frets. Overall it is an instrument built of reasonably good quality materials, including a spruce soundboard (which was split in several places), mahogany back ribs, maple neck, bindings and purflings, etc. But unfortunately the quality of the workmanship was generally quite poor. This was especially true in the finishing of the instrument. Luckily the sound was reasonably good and the neck was straight enough to remedy without much effort. Imagine, only 15 rubles (approximately $20 in 1981) for an instrument made of spruce, maple and mahogany! So, aside from it’s sentimental value, it was certainly worth the time and effort to restore and it turned out to be a very satisfying project. You may be interested in reviewing the complete technical specifications of this particular instrument. Before we start to take things apart it is probably worth looking at a few more “before” pictures. The first order of business however would be to remove everything and then strip off the orange lacquer. I started by removing the fretboard using a hot iron laid directly on the frets. I did not care about scorching the surface as I was going to discard it anyway. On the left you can see what the balalaika looked like after removing the fretboard and pickguard. It seems almost inconceivable not to finish the entire instrument before putting on the pickguard. Also, look closely at the spruce top, it’s a bit hacked up. Now, on the right is the view after stripping the old finish off completely. The ‘hacking’ is much more evident in these photos. The stripping is now in progress. I used “Citristrip” foam. It does a really good job and was quite easy to use. I also hoped that it would not upset the glue too much as I didn’t want to get into a major rebuild at the time I started. I started out just wanting a new fretboard and a better looking finish. But, we’ll get to that later. Let’s take a look at several before and after pictures to gauge the progress of the project. On the left is a view of the neck after stripping, then sanding and getting it ready to stain. On the right we can see that the walnut stain will cover the joinery reasonably well. The transformation of the peghead from the original poorly-finished maple, then stripped, then new walnut veneer added, then inlayed with a Mother-of-Pearl 3-cupola logo, and finally with the tuners (temporarily) back in place to see how it’s going to look. On the right is the same basic progression of the read of the peghead. On the left you can see what the body of the balalaika looked like after stripping and sanding it. On the right is how it looked after putting on shellac and a coat of sealer. Quite a transformation from the original orange finish. The pantsir’ (pickguard, sometimes called (transliterated?) a pancer in English, although I don’t know why as it doesn’t conform to any transliteration system I’ve ever seen) needed to be stripped and refinished. Sometimes it is called a ‘scratch-plate’, which seems more appropriate. I originally chose to fill the grain, then spray it black and inlay five MOP dots along the edges as I have seen in so many photos of older instruments. As you can see by the center photo, it came out looking pretty nice for something that started out as inexpensive birch plywood. However, I later wrapped it in a paper towel to protect the finish and stored it away. Big mistake! The paper stuck to the finish and ruined it. I was back at square one. I thought it might be nice to build a new one out of walnut as I was now using more walnut appointments to dress up the instrument: walnut veneer on the peghead, stain on the neck, a new pantsir’ and eventually new walnut bindings. This would also give me the chance to try some more inlay as you can see in the closeup of the cupola I inlaid into the new pantsir’ made from gold and white pieces of Mother-of-Pearl. Also shown is a picture of the 3-Cupola logo from the peghead. The new pantsir’ came out looking nice, I sprayed a new finish on it, let it dry and then started buffing it out. It split in two along the grain while being buffed. Oh man, what a nightmare (uzhas odin)! Thank God for CA glues. I glued it back together, put a linen tape reinforcement strip along the crack on the back and re-sanded the top. After several coats of sealer and a final spray finish you can’t even tell that it broke. Another important lesson learned along the way, “how to recover from a blunder”. Some people say we learn from our mistakes, others say “as long as you don’t make the same mistake twice”. On the left you can see the tuners with new “Ivroid” buttons to replace the really cheap plastic buttons that were originally on the instrument. The tuners are pretty low quality and I was finally able to find a better set that would fit properly. from Athens. This ‘gifting of instruments’ thing is starting to sound like a pattern . . . The view on the left is the balalaika all stripped, sanded, ready for the finish room (if only I had one), while the view on the right is with the various parts in place. This was to be able to visualize what the finished instrument might look like. So far, so good. Except, I had to put the project away for a while. In the meantime I put the balalaika on the stand and left it. Unfortunately I didn’t think to cover it up and it turned out to be a rather drafty area not too awfully far from an air conditioner. The instrument really dried out over the ensuing months and I picked it up one day only to discover that the seams along the soundboard/binding joints were cracking and coming apart. The soundboard was also cracked in 3 places now, most notably along the center seam. What a disaster!. But, you know, sometimes there is opportunity when a disaster strikes! I decided that what I was going to have to do next was to remove the soundboard and completely fix it up, which was probably a good thing in the long run. It would also give me a chance to actually see the inside which up until now I had never been able to do. But, how? I spent some time looking online in places like MIMF (Musical Instrument Makers’ Forum) and elsewhere for information about how to get the soundboard off. I read over and over again that it basically couldn’t be done easily, or even successfully without ruining the top. Given that one of my objectives was to preserve as much of the original instrument as possible, I really didn’t want to run the risk of ruining the top. I took the maple bindings and ebony purflings off as I would now have to replace them. This would be my chance to make my own walnut strips to replace them with. They came off quite easily now as the glue was breaking down. Perhaps it was the Citristrip? I worked at inserting the edge of a razor saw into the cracks and gently prying to finish separating the glue that remained. One side came off easily. The other was quite a bit more difficult. Over the course of the next two weeks I was able to pry the entire soundboard off without any perceptible damage. The braces were not as good as I thought they should be, poorly shaped and finished, basically just pretty rough pieces of spruce. They had to be replaced, but I didn’t have any material. Ah well, time to place another order to Stewart MacDonald! Now you can see what the instrument looks like once I managed to get the soundboard completely off. Notice the left half of the soundboard on the table beneath the balalaika. You can also see that there is a lot of glue and general mess inside the instrument that needs to be cleaned up. The closeup on the right shows more detail and you get a good glimpse of the linen strips glued in along each rib seam on the inside. The original label is in good shape and just required a little bit of extra hide glue to hold down the corners where it started to come up. 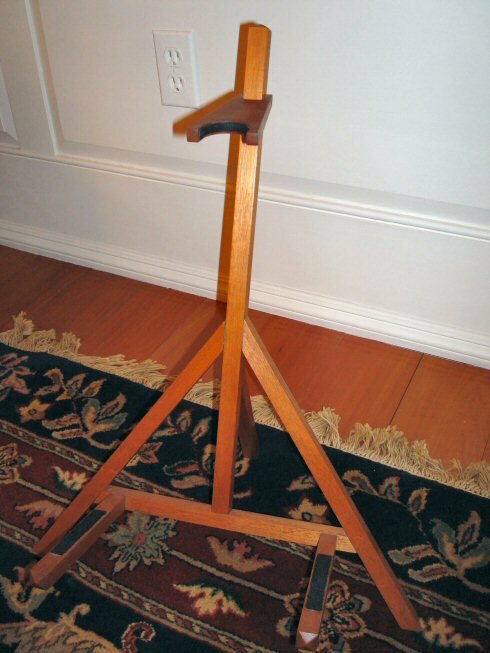 Take a look at the “cradle” I built on the right to hold the instrument when I want to work on it. I got the idea from Jim Flynn’s article in “American Lutherie”. See “Building the Prima Balalaika” by Jim Flynn in either the Big Red Book #2 p. 178 or American Lutherie #17 p. 29. I added some pieces to it covered with felt to support the instrument since I wanted it to be a cradle and not a building platform. It serves the purpose pretty well. The soundboard was the section most badly in need of repair at this point. It had split along the center seam and the seam on the left. It was also cracked to the right of center, but not along the seam. All of these breaks needed to be repaired. If you click on the photo above you can see the darkened lines where the splits occurred. 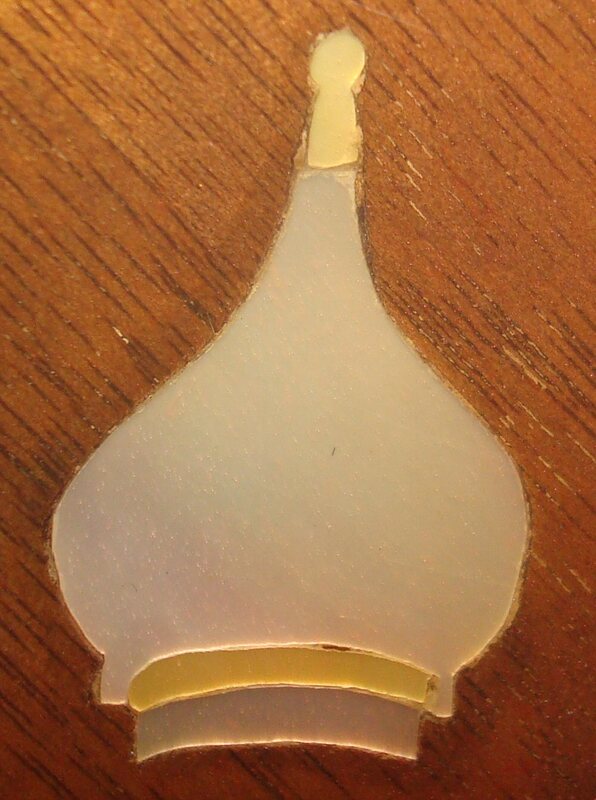 Balalaika soundboards are made in four pieces unlike the usual two pieces used for a guitar. 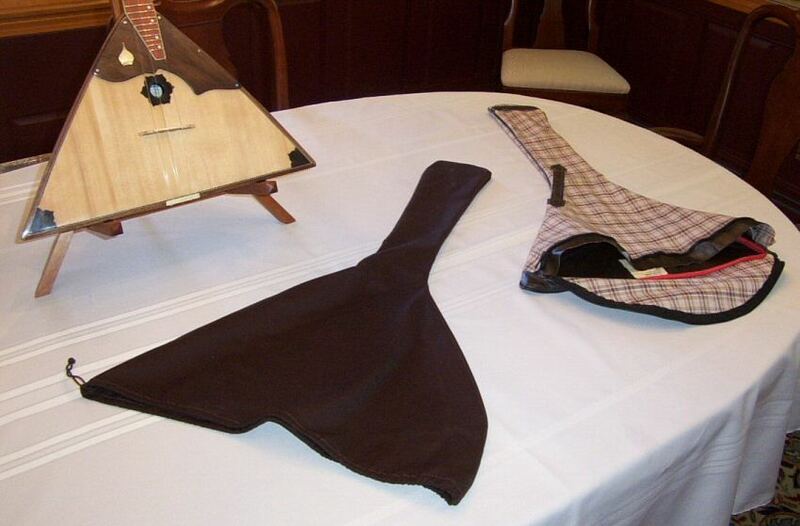 The width of a typical prima balalaika is approximately 17″ along the base. After truing the seams and re-gluing the soundboard, I replaced the two crudely cut braces with three new Engelman spruce braces carved according to the Kupfer Moskvichka plan. The Moskvichka plan calls for a diagonal brace just below the soundhole, which necessitated moving the lower brace down. After carving the braces and gluing them in place, it put a noticeable curve in the soundboard. After all was dry I noticed that it would be difficult to attach the top due to the new arch. I next figured out that I would have to build up the transom on the inner edge to support the soundboard as well as add a strip of walnut along the outer edge that would show in order to support the new bindings. These strips would both need to be tapered from 2mm in the center, down to zero at the edges. All went well as I sanded them down to very thin tapers. That is, until one of the pieces broke about 1.5″ from the end. Luckily I was able to reglue it and use it instead of starting over again, and it does not show at all. I was finally ready to re-glue the top. This operation was the primary purpose I built the cradle described earlier. I used liquid hide glue for this job. Luckily I have lots of clamps as I needed extra pressure to ensure a tight fit due to the amount of curve I now had. The rubber band system I’ve seen used elsewhere just wasn’t going to be enough to do the job. After successfully gluing the top it was time to install the new walnut bindings that I made to replace the original maple ones. These walnut pieces would look much better with the walnut peghead veneer and the new pickguard. First I laminated a strip of “ivroid” along the edge of each walnut strip, then glued the bindings into place. There was sufficient overhang to ensure that after scraping and sanding I’d have a nice tight fit and smooth looking edges. After everything was dry, the bindings were cut flush and scraped and sanded. Things were really starting to take shape. You can never have too many fretboards! Actually, you can. And I did along the way . . .
As you can see by the photo above depicting four different (original included) fretboards, this was somewhat of a hit or miss prospect. 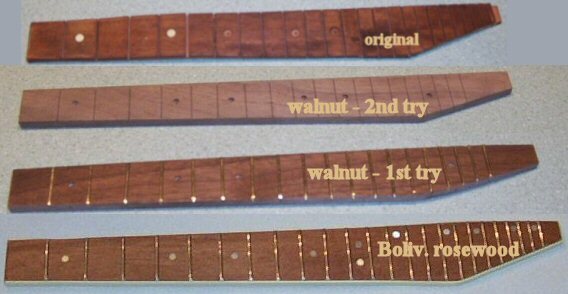 I started out to make a walnut fretboard thinking that would be kind of neat to have the wood match the new trim. But I had two failed attempts at reproducing the original. One was the direct result of trying to use a belt sander for a job that was “just too small”. That’s sort of like using a sledge to drive a finish nail. Then I made another walnut board, but afterall decided that either rosewood or ebony would be more appropriate. I have a small stockpile of Bolivian Rosewood (Pau Ferro, aka Machaerium spp.) and read that it is supposed to make a very nice fretboard, and as it turned out, it really did. After all the work involved in cutting the billet, cutting the slots, sanding the radius using a 12″ radius sanding block, and finally installing the frets, it was quite a lengthy project. I took the additional time to bind the entire board with “ivroid” for a really finished look. I think it came out rather well. The next task, now that the body was ready, was to install the fretboard, which after much trepidation, turned out to be pretty simple. I used hide glue on the fingerboard. But before gluing it, I inserted two very sharp pins that would dig into the neck from the underside of the board so that the glue would not make the fretboard “drift”. The clamps were left on for 24 hours, and then it was left to really dry for a few more days before scraping down the excess glue and making sure that everything was even and smooth for final sanding before applying the finish. Fret leveling, crowning and polishing came next. Two passes were necessary to get it just right as shown in the photos. I reapplied clear sealer as some of it was stripped off from all the tape used in the fretting process. Finally, all of the tape was removed and the final 4 coats of lacquer were applied to the neck and head of the instrument. Then the balalaika had to sit for a week to cure before final buffing out of the finish could be done. This is when patience is called for, because the project is so close you just want to string it up and play it. After approximately 10 days I did the final fitting of the upper nut and the bridge, temporarily installed the tuners and strung it up for the first time in over a year. The difference in the sound is difficult to describe, but it is wonderful. After stringing it up I took it upstairs to the empty living room where I’m putting the final finish on the new hardwood floor in the living room, so it has a nice ‘echo’. The sustain compared to the original is markedly better, given that I don’t recall there being all that much before. Perhaps the fact that the braces had both come loose and the soundboard was split into pieces was a contributing factor! I took all of the parts off and commenced to do the final buffing and polishing. After buffing, I reinstalled everything and strung it up again. I even put the metal plate on the back of the headstock. But there was one more thing that was bothering me. The tuners just sit inside a cavity hollowed out of the back of the headstock and are not ‘fixed’ in place. They kept shifting down and applying a great deal of pressure on the back plate. I had to figure out a way to fix them in place but not permanently. The wood is too thin to use screws or metal fasteners, so I cut a couple of small blocks of spruce that would fit very tightly in between the tuners and force fit them in place with some CA glue, clamped them down and they hold the tuner nicely in place. After reinstalling the back plate, which now fit flush on the back instead of being ‘pressed’, I could truly say it’s done. But those old tuners really had to go, see The Search for new balalaika tuners below. The only thing remaining was to do was to fix the old vinly/fabric carrying case that came with the balalaika when I got it. The zipper had broken many years ago and I took it to a local place called the “Zipper Hospital” but they said it couldn’t be fixed or replaced. I bought a heavy duty zipper and was determined to do it myself. I sat down with my 100-year old Singer sewing machine, and although I’m no seamstress, I managed to install a zipper satisfactorily in about 20 minutes. I then proceed to make a ‘bag’ to cover the balalaika to protect it when it’s on the stand or going into the fabric case. I don’t want to run the risk of scratching it. Later on I also learned that it was possible to purchase a much more substantial case, called the Balabag II, from a now defunct “import” company called Imperskay Music in New Jersey. Needless to say, I did! Although I hang on to the old vinyl one, the new case is padded, has many pockets, straps, etc. It’s a major improvement. The “Perestroika” project was ready to be unveiled. Ironically enough the first person to see the completed balalaika outside of my family was my friend who gave it to me in the first place. She proceeded to tell my children the story of trying to carry back all of this stuff from Moscow those many years ago. I hope that the restoration is a fitting tribute to our friendship and a way of saying “spasibo” (спасибо) to her. Be sure to click the pictures below for a better view. The Search For New Balalaika Tuners! Anyone who has ever tried to obtain new tuners for a balalaika will tell you just how impossible they are to find. 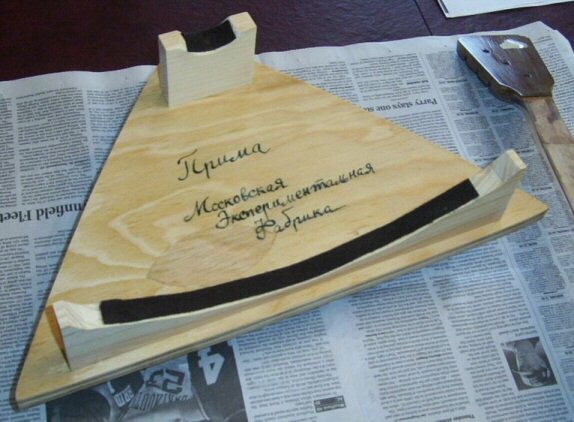 The quality of Soviet-made balalaika tuners is poor, but the tuners being made in Russia today are pretty nice and are relatively inexpensive. The simple fact is that you cannot just use guitar tuners (or any other type) on a balalaika. You have to use balalaika tuners. Like guitars, there is a certain expectation among the players that balalaikas conform to a particular look and feel. I was fortunate enough to find a contact in Moscow who arranged to have a few sets of tuners sent to me directly. This is only possible if you can communicate in Russian, otherwise you’d have to find a U.S.-based outlet. Fortunately, Chinese-made balalaika tuners are now available through an “import” company called Imperskay Music in New Jersey. Once I got my tuners from Russia I changed out the tuners on this balalaika for the new set made by “Zarya Plyus” in Penza, Russia. Although these were inexpensive tuners, I was very pleased with the quality of them, especially compared to the old Soviet-made tuners. In comparing them to the tuners made in the Soviet days they were like night and day. The balalaika truly stays in tune now, and the worm gears work very smoothly. The tuners on the left in the upper-right photo are the original Soviet tuners from the balalaika and the ones on the right are the new replacement “Zarya Plyus” tuners. There’s a stark difference in the quality. Zarya Plyus is an engineering firm that purchased a former watch manufacturing facility in Perm. Close-up photo of original Soviet-made gears. 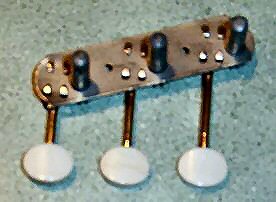 Close-up of original Soviet-made tuners.